The privacy of my visitors to FireworksInPennsylvania.com is important to me. At FireworksInPennsylvania.com, I recognize that privacy of your personal information is important. Here is some information on what types of personal information I receive and collect when you use and visit FireworksInPennsylvania.com, and how I safeguard your information. I never sell your personal information to third parties. As with most other websites, I collect and use the data contained in log files. The information in the log files include your IP (internet protocol) address, your ISP (internet service provider, such as Comcast or Time Warner Cable), the browser you used to visit my site (such as Internet Explorer or Chrome), the time you visited my site and which pages you visited throughout the site. 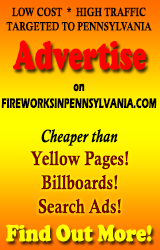 I also use third party advertisements on FireworksInPennsylvania.com to support the site. Some of these advertisers may use technology such as cookies and web beacons when they advertise on this site, which will also send these advertisers (such as Google through the Google AdSense program) information including your IP address, your ISP , the browser you used to visit the site, and in some cases, whether you have Flash or other technologies installed. This is generally used for geotargeting purposes (showing New York real estate ads to someone in New York, for example) or showing certain ads based on specific sites visited (such as showing cooking ads to someone who frequents cooking sites). In addition to using cookies mentioned above, I also may permit certain third party companies (mostly Google, but possibly some others) to help tailor advertising that I (or Google) think may be of interest to users and to collect and use other data about user activities on my sites. These companies may deliver ads that might also place cookies and otherwise track user behavior. These cookies will in no way identify you or give anyone access to your computer. You’re way too important for me to do that to you. You can choose to disable or selectively turn off the cookies or third-party cookies in your browser settings, or by managing preferences in programs such as Norton Internet Security. However, this could affect how you are able to interact with this site as well as other websites. This could include the inability to login to services or programs, such as logging into forums or accounts. Some (but not all) of the links on this site are for items for which I get paid a commission. It’s how I recoup some of the costs associated with maintaining this site. I don’t suggest or promote crap, however; if I recommend something, it’ll be something I have or would actually buy or use myself. If you don’t feel like you can trust me on this, then you probably shouldn’t buy from the links. Oh, and I can’t speak for what shows up on the Google ads. I have minimal control over those. NONE of the event links are paid or sponsored in any fashion. You have my word.